HPR is honored to present for the first time in the Atherton Studio the 2017 winners of nine Nā Hōkū Hanohano awards, Keauhou. This young trio, recognized for the Hawaiian language performance on their debut self-titled album and as the year’s favorite entertainer, is dedicated to the performance, preservation, and perpetuation of traditional Hawaiian music. 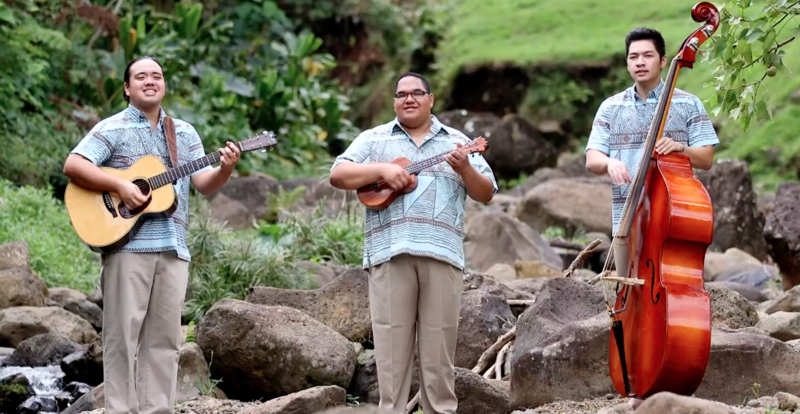 Keauhou is songwriter and guitarist Zachary Lum, his brother Nicholas Lum on bass, and Kahanuola Solatorio on ʻukulele. For their Atherton premiere on Saturday, July 29 at 7:30 p.m., they promise an evening of mele (song), hula, and moʻolelo (story), with possible surprise guests. Reservations for Keauhou may be made online at www.hprtickets.org or by calling the station (955-8821) during regular business hours. Tickets are $30 general, $25 for HPR members, and $15 for students with ID; service fees are applied to online orders. The Atherton Studio is located at Hawaiʻi Public Radio, 738 Kāheka Street. Doors open a half hour before the performance. A limited number of tickets remain. The name “Keauhou” can be translated as “the new/renewed generation.” Its members, all graduates of the Kamehameha Schools Kapālama, found their musical roots through their involvement in the many musical and cultural opportunities offered on campus. Kahanuola and Nicholas recently graduated with their Master's Degree in the fields of Education and Hawaiian language, respectively, at the University of Hawaiʻi at Mānoa. Zachary is currently the Choral Director of the prestigious Kamehameha School's Concert Glee Club and also a Master's candidate in the field of Ethnomusicology at the University of Hawaiʻi at Mānoa. All three are active and passionate educators and cultural practitioners in their fields. Keauhou is currently in the process of recording their second project, with an expected release before the end of 2017. Keauhou, (l. to r.) Zachary Lum, Kahanuola Solatorio, and Nicholas Lum.